LEDAS Ltd. (www.ledas.com), an independent software provider of computational components for PLM and ERP, releases next version of its 2D geometric solver. The main new feature of the recently released version 2.0 is its capability to deal with discrete entities in a geometric model. 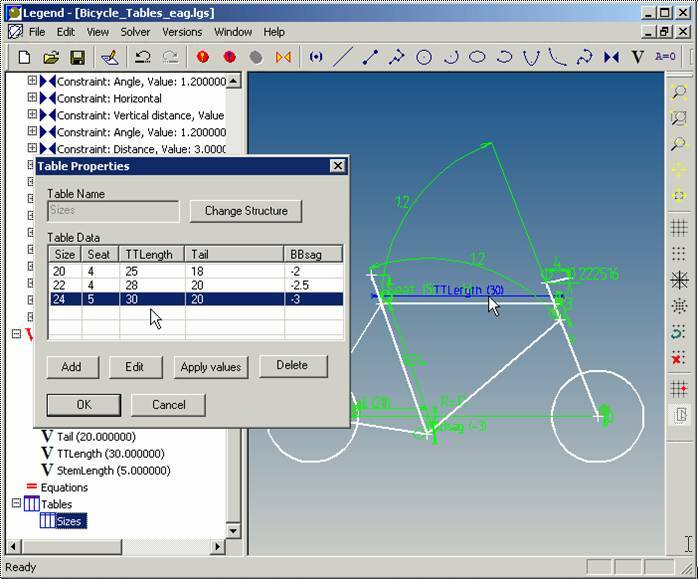 The difference between real-life engineering and pure math problems is that real designs often contain parts and elements of standardized sizes or sets of predefined mechanisms configurations and models. Describing these problems with the help of continuous entities, has always been a drawback of geometric modeling. Now any licensee of LGS 2D 2.0 has capability to specify the table constraint which lists all possible combinations of values of different variables in the model and ensures that LGS 2D selects one of these configurations during computations, providing a user with a solution consistent from engineer point of view. In order to limit a particular variable by a set of all possible values, one can use more simple enumeration feature. Besides, the success rate and naturality of LGS solutions has been increased. A number of bugs, including the lack of unfixed parameter support for Vertical and Horizontal Distance constraints, are fixed. The LGS 2D geometric solver is a computational module, engineered to support two-dimensional parametric design in CAD and computer graphics systems, as well as many other applications that require parametric connections or constraints to be set between geometrical objects. LGS 2D supports creation and modification of the geometric models by means of (explicit or implicit) constraints. Typical geometric objects are points, lines, circles, or arbitrary curves. Objects can be fixed in an absolute coordinate system or with respect to each other (the latter feature is provided by the so-called rigid sets of objects). Set of geometric constraints includes logical constraints between geometric entities (like coincidence, parallelism, tangency, etc. ), dimensional constraints (that specify the required values for given distances, angles or radii). LGS 2D moves and rotates objects to positions where all constraints are satisfied trying to perform minimal possible transformations of initial configuration. LGS 2D is a cross-platform software. It is a set of libraries that runs under all Windows, Linux, *BSD, AIX and other OS. Being written in C++, LGS has a C-based API that allows integrating it into a broad range of software applications (even not written in C/C++). LGS 2D can be used as a self-supporting component, or jointly with 3D version. Being a successor of 2D version LGS 3D solver significantly expands application possibilities to apply computational engine. It supports creation and modification of the 3D geometric models. Both 2D and 3D versions have similar API, the set of three-dimensional objects and constraints intersect with the analogous set in two dimensional case, therefore, providing a complete parametric solution for all aspects of CAD/CAM system functionality – from 2D sketching to 3D modeling, kinematics simulation, assembly design and analysis.